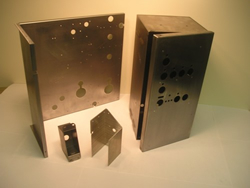 Using our full array of metal working shop equipment, we can provide a wide range of products and metal fabrications. Our customers come from a variety of industries, which include medical, telecommunications, electronics, industrial manufacturers, commercial developers, building remodelers, transportation and food services. 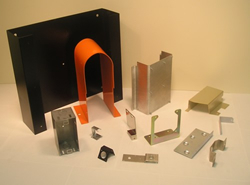 Our fabricated products include: assemblies, bases, boxes, brackets, cabinets, cases, chassis, electrical enclosures, metal frames, decorative panels, faceplates, racks and weldments.